One of the most iconic summer treats is s’mores. The combination of chocolate, marshmallow, and graham crackers is one that was surely made in heaven. How could mere mortals come up with the combo of warm chocolate, gooey marshmallows, and crisp graham crackers? But did you know that there is so much more you can do with that flavour combination? Not only can you do bars, ice cream, and even cheesecake, but you can also do cupcakes. 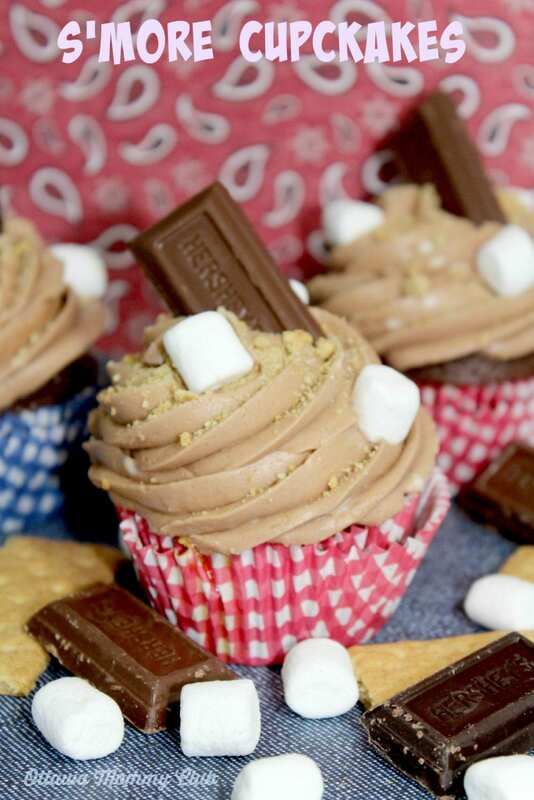 These S’mores cupcakes are going to quickly become a favourite with your family. These s’mores cupcakes would be wonderful for family get togethers, barbecues, and even a community gathering. Not to mention that these would do extremely well at any summer bake sale. Who could resist the fluffy chocolate marshmallow frosting or the graham cracker crust on the bottom of these cupcakes? Add the cute addition of pieces of chocolate and miniature marshmallow and the look of these cupcakes will be enough to catch the eye. What makes these cupcakes truly amazing though is that they are completely made from scratch. While it can be tempting to reach for a mix, baked goods come out so much better when you make everything from start to finish. Plus, it’s nice knowing what you’re feeding your family. That’s something that can’t be said for boxed cake mixes. Who can even pronounce some of those ingredients? All of the ingredients in this recipe are easy to find in almost any grocery store. The only one you may have a bit of trouble finding in small stores is the marshmallow extract, but most big box stores like Walmart should have it. If you want something different to make this summer, you can’t go wrong with these s’mores cupcakes. Not only are they delicious, but they are so much easier to eat than real s’mores. It’s a win/win! 2. Stir together sugar, flour, cocoa, baking powder, baking soda, and salt in large bowl. Add your eggs, milk, and oil. Beat with a mixer for 2 minutes. Set aside. 3. Break Graham crackers in half and place in ziplock bag. Pound with cookie roller until finely crushed. 4. Scoop 1 Tablespoon of graham cracker into cupcake tin and then scoop chocolate cake batter onto graham cracker. Push in 3 small marshmallows in centre. 6. Let cupcakes cool. Once cooled, put on wire rack. 1. Place softened butter in mixing bowl and add in the cocoa and powder sugar. Mix on low until combined. Scrap sides and add in the extract. 2. Add in heavy cream and scrap down the sides. 3. Garnish with graham cracker crumbs, marshmallows and a Hershey chocolate. I hope you enjoyed the Irresistible S’mores Cupcakes Recipe. If you make it, make sure to share with us on Facebook or Twitter! Also, check out all of our other Recipes. Wonderful looking cupcakes! Look so good! thanks for the recipe! Will have to try them to take on a picnic,camping or just because! Oh my these look so good, going to have to make these up, they sure won’t last long that’s for sure!! These look really tasty, my grandchildren would no doubt love them too. These look great Lyne! An awesome alternative for those who cannot get to a campfire. Definitely! I think most will prefer it to the real ones lol! Oh wow, these look and sound delicious! I love s’mores! Wow,this really is a tasty delight. These are by far the most delicious treat ever! WOW! These look absolutly delicious! thanks! These sound so delectable.My grandchildren will love them when I bake them and invite them over.Thanks for this post.